Quietly, beyond the headlines this year, the world achieved something great: we reached “the beginning of the end of AIDS”. For the last three years, ONE has tracked progress towards this global milestone in an annual accountability report, and this year’s report shows—for the first time in the history of the disease—that the world added more people last year to life-saving AIDS treatment than the number of people who became newly infected with HIV in the same year. This is a huge accomplishment. Target HIV where it is, not where it is easiest to reach. This includes developing tailored strategies to reach marginalized populations more effectively. Deploy bold new funding from a more diversified base. We cannot accelerate progress with flat funding or even incremental increases from the same handful of donors. Build resilient health systems that can tackle AIDS alongside other health challenges. We must ensure that next time a crisis like Ebola emerges, countries can weather the storm. 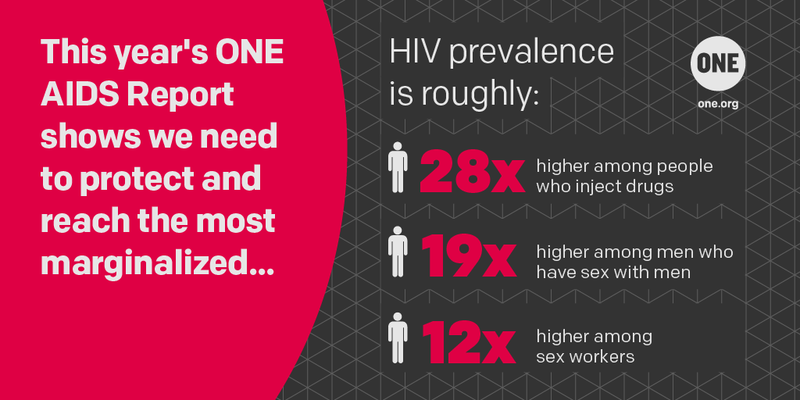 To mark World AIDS Day and to keep the momentum going, please help us share our report’s key findings. Download the full report below, and choose from the following share graphics to help get the word out through your social networks.